Megan McArdle astonished me this afternoon by penning a piece in which she confessed to buying a $1,500 food processor. I had no idea that such a thing existed. You probably saw this link to U.S. Palm's new Defender body armor for civilians at Instapundit. It's an interesting concept. I have a set of civilian body armor that I received as a gift in Iraq, though I didn't use it there -- the military had provided me with a set of Interceptor armor that was more practical for warfare. I've still got the other set, though it's packed away. The probability of a home invasion in rural Georgia approaches zero, especially for those of us with dogs and rifles. Still, in an area without those advantages, I can see how keeping a set handy might be a sensible precaution. I would like to say, though, that if you already have a handgun and two hundred dollars to spend to improve your defensive capacity at home, the more sensible thing would be to use the money to buy a shotgun. Other, more valuable foreign currencies, for example. In 1923, that meant the US Dollar. This time round, since the Swiss National Bank has lost the plot, we would favour the Canadian and Singapore Dollars. Back then, the answer lay in gold, and we think it does this time, too, as the finest currency protection paper money can buy. Yale Economist Robert Shiller has suggested that one of the reasons for equity investors’ irrational exuberance in the 1990s (it was Shiller, and not Greenspan, who coined the phrase) was the fall of the Berlin Wall- which seemed to conclusively display the superiority of western free market capitalism over the discredited Soviet model. Now the superiority of the western model is so apparent that we have cash-strapped eurocrats looking to raise money from the Communist leaders of a country, most of whose citizens live in abject poverty. This writer is proud to call himself British; he would be disgusted to be regarded as European. The two problems at the core of the collapse seem to me to be the idea of monetary manipulation as a way out of the crisis, and the idea of Keynesian stimulus as a way out of the crisis. The two models are sometimes said to be in competition; in truth, they are mutually-reinforcing points of failure. The problem is that both of these theories are wrong about the origins of wealth, and how wealth is produced. Understanding that issue is the beginning of an understanding of how to build a stable system. In spite of economics' reputation as 'the dismal science' (a nickname, as you recall, that came from Malthus' writings on population growth), it isn't actually a science but an art. In the arts, it is not uncommon to discover that a fashionable idea plays out badly in the end, and older forms are proven to be more valuable than we thought they were when we set them aside. The problem with monetary theory is that it begins from an assumption that wealth increases as debt increases (because, according to the theory, 'every asset is someone else's liability' -- if I borrow money from you, my debt is a liability of mine and an asset of yours). The debt of the public sector is thus the wealth of the private sector (because we own the bonds). Thus, you can repair the economy by taking on more debt (which increases private wealth, allowing the private sector to stimulate itself by trading debts as if they were wealth). Wealth doesn't come from debt, and in fact it doesn't come from money. Wealth comes from production -- a fact that Marx understood better than modern economists, with his labor theory of wealth. Marx's problem was that he tried to make labor account for all wealth, whereas in fact it accounts for only some increases in wealth. Marx was smart enough, though, to know that it wasn't money that creates wealth. If I have a factory or a farm that is producing wealth for me, I can take on a debt in order to expand my operations. According to monetary theory, wealth is created because I take on a debt to the bank, increasing the bank's wealth. In fact, wealth is being created whether I take on the debt or not -- it is the factory or the farm that is creating the wealth. All the debt does is allow me to expand the wealth-creating instrument faster than I could have done otherwise. Now, if that is the case, the function of money is not to create wealth, but to serve as a store of value and an accounting mechanism for trade. Proper monetary policy would therefore be to sustain the stability of your store of value, so that trades and debts in that money are stable and reliable for those making such trades or taking on such debts. The political policies associated with such stability are counterindicated by all the best advice of modern economists, and therefore opposed to what the politicians would do if they could come to an agreement. In America this is sometimes called the 'strong dollar' policy, but actually it's the pre-Federal Reserve policy. The Federal Reserve was created to stabilize the dollar through monetary policy; instead the banks who lead it have used that as a pretense for profiteering manipulations that have cost the dollar 96% of its purchasing value since the creation of the Fed in 1913. This is what we would expect to happen if we gave control of our wealth to professional gamblers, and indeed it is just what did happen. The value of the dollar in terms of what it could purchase, before the Fed, actually was stable. You can test this assumption with this calculator. Put in an amount, say $100, with the starting year 1790 and the ending year 1890. The value in terms of the consumer price index is almost the same. Now go from 1790 to 1890. Suddenly it takes over a thousand dollars to equal a hundred dollars in 1790 purchasing power. The first two problems are given to conservative solutions; the last one really is not, and will require a new conceptual model from us. The closest extant one is what the British used to call "outdoor relief," that is, government make-work that uses the unskilled even though it is uneconomic to do so. I am very fortunate to have space, and a few moments of quiet, for thought. We had a fine family meal today, thanks mostly to my sister, who cooked for everyone. I only made croissant rolls, with 128 layers of butter, some filled with chocolate or cheese. Here are two of the many pies that appeared at the feast, along with a glass of good beer. This stone ring appears on my father's land. I built it some years ago out of stones plowed up by the county when they were fixing the road. It was good to have a day to go back to the ancestral home, and spend time with the people I grew up among. I hope your Thanksgiving was a fine one: that you had time to reflect on good things, and be grateful. 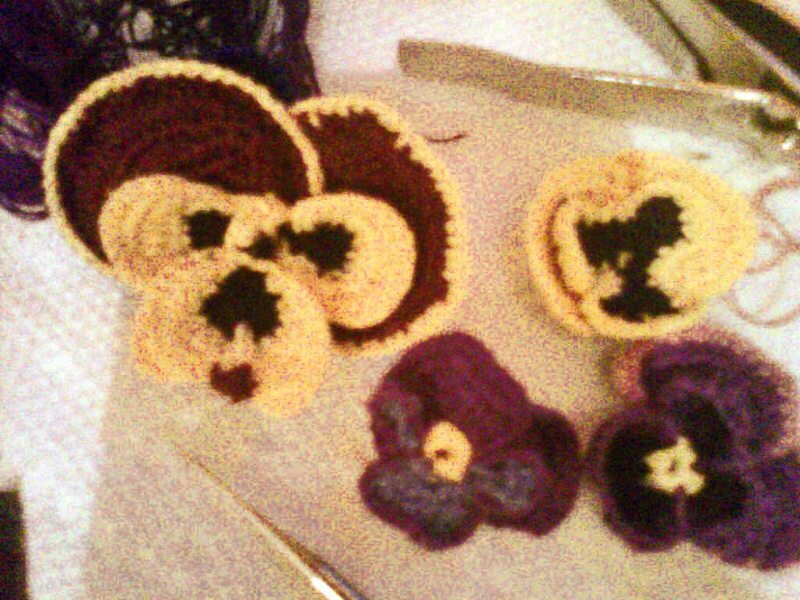 Now my sister says she's making about a dozen chocolate-brown silk purses as guest-gifts, and would like to affix several crocheted flowers of some kind to each of them, in deep colors. 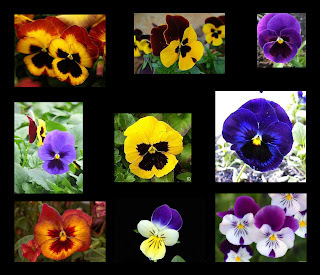 I'm thinking pansies. 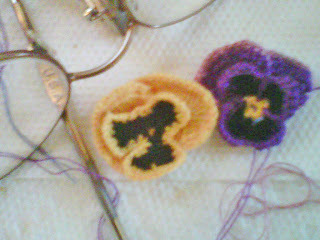 The stylized pansies in the ribbon pattern above didn't seem right to me, so I've been trying to fashion my own pattern. These are my first experiments, done with a double strand of embroidery thread, which amounts to about a size 70. I ended up with flowers about an inch across. Update: Another effort, closer to 2 inches across. I'm liking this pattern. I've just got to fiddle with the shape of the large pair of petals in back, and work on making the tiny, tiny stiches more regular. It's hard to see the row of stitches you're working into, even with my (seldom-used) glasses on under a bright light, but a contrasting color keeps you honest. As you can tell from the photo, the size-13 crochet hook is so small you can barely see the hook at the tip. The colors, by the way, are much more brilliant in real life than I can make them appear with my phone camera. And then I stumbled on something that made me want to drop crocheting and go learn how to work in metal. Did you ever see anything so gorgeous? 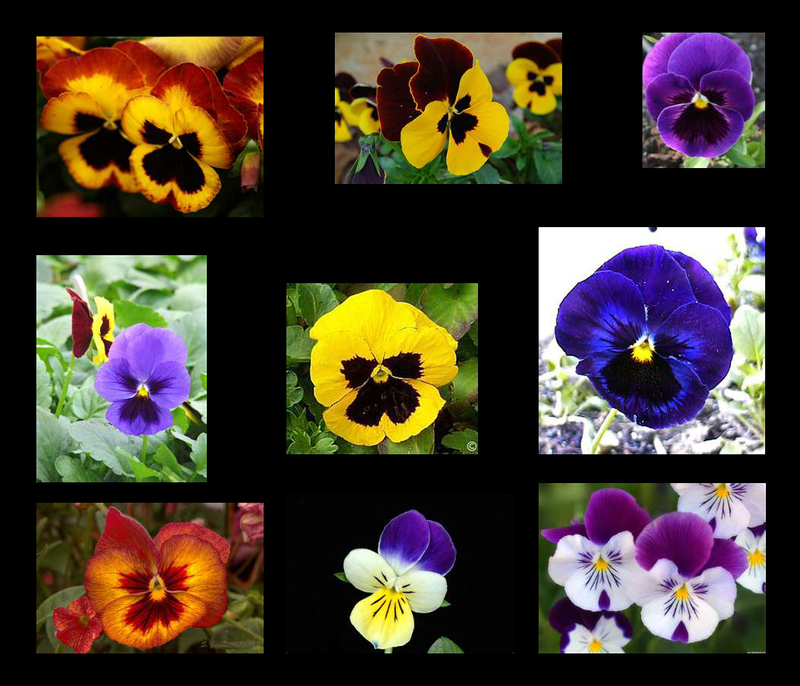 Look how the pansy stems twist around the base. 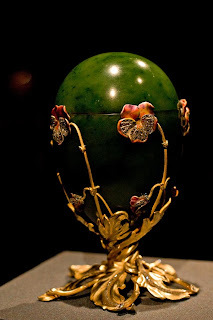 Follow the link to see what those crazy jewelers put inside this jade Faberge egg with pansies. 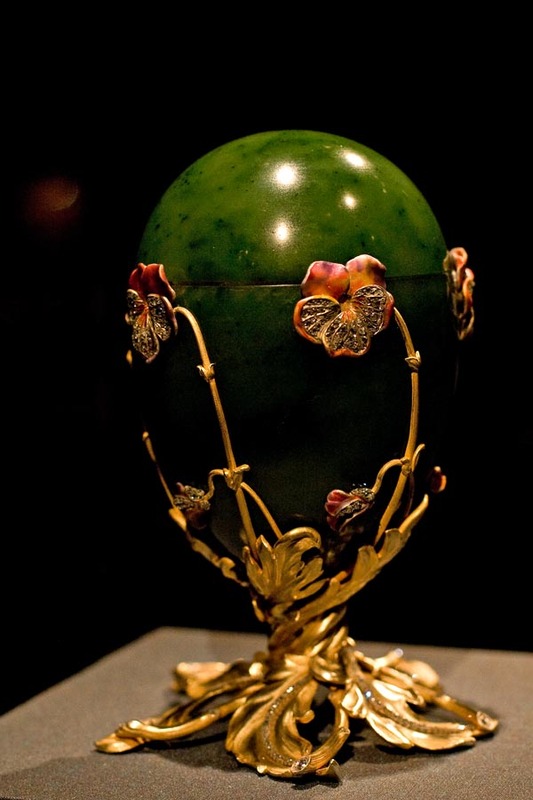 For some kinds of exuberant excess, you really need an imperial family to plunder the entire country, so they can amass enough wealth to employ over-the-top jewelers. She's good and right on the question she takes on here. Let's review Pakistan's relationship with the United States. Pakistan signed a mutual defense agreement with the United States in 1954. In 1965, it fell into war with India over the Kashmir vale. The terms of the agreement suggest we should have backed them up; we did not, but declared something like neutrality in the conflict. Of course, we were involved in Vietnam at the time, and the Cold War, and this was a distraction from that twilight struggle; but we broke our word. A second war in 1971 produced significant American support for Pakistan -- and also their greatest loss in their history as a nation. The American perspective on this conflict is that we did all we could do, being constrained by the Soviet Union and China (then working with India, ironically enough). The Pakistani perspective, I learned from listening to their liaison officer at USCENTCOM last summer, was that America let them down. We were supposed to 'mutually defend' them, and they lost almost half their territory. Add to that the current issues over the drone strikes -- which the US continues to execute in spite of the clear statement by Pakistan's legislature that it opposes them because of civilian casualties -- and we have a menu of complaints on offer. We continue to carry out those strikes not with their permission (as in Yemen) but in violation of their sovereignty as a nation state. In other words, some of Pakistan's complaints are invalid -- but others are not entirely unfair. There isn't a happy relationship here, but there is a relationship. We're better off when it's stronger than otherwise. Pakistan is divided internally between factions that support anti-US forces, and factions that oppose them for reasons of their own. We have to play in this game. The lady is right, in other words; and by the way, Fallon ought to fire his band. Go hire some of those OWS drummers; whatever else can be said for the movement, those guys have their moments. And clearly they're unemployed, so you can probably get them for a reasonable rate. Here's one of the last of the old school PSYOP NCOs. 59 years young! Greyhawk features a beautiful quote in his long piece today. Chester G. Hearn, in a recent history of Harper's Ferry in the Civil War , effectively summed one aspect of the battle with an observation that likely had to wait well over a century to be made: "With roughly eleven hundred men involved in a skirmish lasting four hours, where total casualties added up to five killed and twenty wounded, enough cannot be said about poor marksmanship." I have a Russian friend who has been arguing to me for years that India represents humanity's hope. Perhaps he's right. You have to watch a minute or so into it before you begin to see why. Although, in truth, I think I've seen this act before. To my great pleasure, I see that Sierra Nevada's annual release of Celebration Ale has begun. If you like a dry, hoppy beer of the IPA type, I've always thought it was quite good. We shall mark this occasion with appropriate fanfare. If you liked that, Eric Blair recommends Den Gyldne Svane ("The Golden Swan") the next time you're in Denmark. It looks fantastic to me. In The Corner, John Derbyshire links to a story: Caring and Trust linked to genetic variation. Individuals homozygous for the G allele (carrying two copies of the G version of the gene) of the oxytocin receptor tend to be more "prosocial," defined by researchers as the ability to behave in a way that benefits another person. In contrast, the carriers of the A version of the gene (AG or AA genotypes) tend to have a higher risk of autism, as well as self-reported lower levels of positive emotions, empathy and parental sensitivity. Not Exactly Rocket Science notes that the sample size for the study is very small, so it's too early to say "this gene causes this trait." But imagine we reach that point. Imagine further, we reach a point where we find a set of genes that influences not only sociability and altruism, but tribalism - the ability to be extremely caring and altruistic towards your own kind, but dehumanize the outgroup. Mr. Derbyshire paraphrases Trotsky: "You may not be interested in this stuff, but it's interested in you." I read today that Larry Munson, the voice of the Georgia Bulldogs, died this weekend at the age of 89. Up North: You have to ask, "Where's the stadium?" When you find it you walk right in. Down South: When you're near it, you'll hear it. On game day, it becomes the State's third largest city. Up North: Neutral and paid. That was Larry Munson. We all loved him for it. Except for those Georgia Tech guys, of course -- but I think they understood. Take a moment, and watch the whole thing. That seems like a fair reading of Genesis 3:21. Does PETA have a response to the gentleman? With every stroke they take, the boys are displacing more than water. They could knock girls off the awards podium and make it harder for girls to qualify for All-Star honors and the postseason. There's a fairly easy solution to this, which is to honor Title IX by simply including women in all sports. Of course, almost none of them will be able to compete in "soccer" or "swimming," as opposed to "women's soccer" or "girl's swimming." The remarkable finding of their study is that, compared with the participants who were “only” in the 99.1 percentile for intellectual ability at age 12, those who were in the 99.9 percentile — the profoundly gifted — were between three and five times more likely to go on to earn a doctorate, secure a patent, publish an article in a scientific journal or publish a literary work. A high level of intellectual ability gives you an enormous real-world advantage. If that's where all human progress is, we need to rethink our approach to education, and how we train our children for life. If you're not in the top half-percent, you might as well take up Zen gardening: it's a surer way to achieve internal peace. Accept your limits: let go. You can read an interview with these ladies here. (H/t: Medieval News).